click to enlarge Probably the most mportant place to define and reflect the historic character of a home is the porch. It will benefit you and your family for years to come. The impact to the character of the house in coordination with doors, fanlights, sidelights, pilasters, entablatures, columns, balustrades, and stairs will add value beyond financial gain. What is the porch used for? 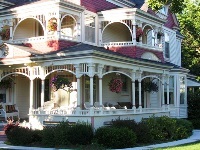 The relationship of space, features, materials, and finishes, give a home historical character. Choosing the most appropriate treatment for a porch raises the question as to its use. Is it the main, formal entrance to a grand, large home? Or will it be the formal entrance to a rather more modest home? Perhaps it’s not the ‘front door’ but the entry from a porte-cochere. Or it’s the rear of the home overlooking the gardens or another scenic view. In other words it’s a place of quiet, and perhaps family and friend times. The porch can have two distinct functions – The front entry and the display of the architectural period statement and the intrinsic value, the actual use. Create a warm welcome The design of a porch should be to create an architecturally significant, welcoming entry, to focus views of the landscape, to provide a retreat, and/or to serve as an extension of the living space of a home. It can be enclosed by screen, latticework, windows, or design featured walls. They are usually architecturally unified with the rest of the house, while decks which are typically open to the sky are not usually architecturally integrated with the home design. Although as more people become concerned with period design and statement architectural integration is becoming more common. 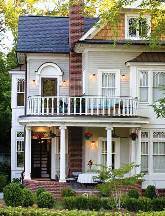 Providing protection from sun and rain, porches can become an exterior room that may be used as living space. Accommodated with chairs, tables, and other furniture, the value is greatly enhanced as a place of relaxation and entertainment. The key to a good porch is having a good design. •	Will it match and complement the house? •	Where’s the best location? •	How functional and convenient will it be? •	Is the size too big/small for the yard and house? Always keep in mind future updates and features for your porch plan. You might want the flexibility to have screen windows that could, in the future, be changed to sliding glass doors. This will require additional framing in those areas and must be included in the plan. Consider the location of the entry and exits, and the flow in relationship to the main house entry. It may be possible to utilize an existing window or door opening to fit in with the scheme of the house. Will you look over a garden or pool, the street or a scenic view? Will there be built in amenities? How about the sun and wind? As a reflection of our home, an invitation to passersby and an open window to the world around us-the porch can be the threshold to the outdoors, a getaway to read a good book or a place to share coffee and conversation with friends. It will be a placewhere we build our memories, watch our children grow, enjoy a cool drink in the summer and we find our private moments to take in life. Gingerbread will add charm to your home's porch! and plenty of room for furniture. 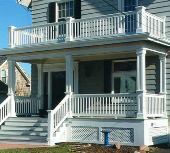 A beautiful radius, double porch. Notice the theme used above the 2nd floor door . A nice Federal wrap around. 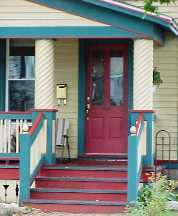 Notice how the entry is set apart from the sitting side of the porch. A Georgian house with a Federal porch. A nice Federal. A good example of a narrow home and a period styling facade. A nice side or garage service entry. New door and old, trim. A nice combination of brick and stone with simple columns. 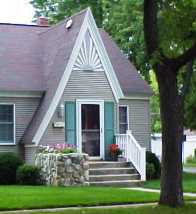 A good example of a narrow home porch and the ability to place furniture. Another nice side or garage service entry. A nice brick walk and good sized Georgian brackets. An interesting porch entry. It looks like a Queen Ann- notice the door and window bay entry. It has enough room to sit on both sides of the porch and still comfortably allow entry. It also gives privacy with the enclosed sides.